Um and GUESS WHAT?! Chris pointed out to me yesterday that my little blog has been nominated over on the Lovelies Awards for best Design Blog!! Oh my gosh!!! If you have a minute will you go check it out? I am just humbled to be among so many amazing blogs! Please vote for your fave and while you are there, you can nominate some of your favorite shops and blogs:) So many good ones! What are your plans for V-Day?! Celebrating singlehood? Going out with your love? Or maybe ignoring it all together? he he. I have some surprises for husband up my sleeve:) He usually out does me with sweet and romantic little things so I am trying to beat him this year! Love how long they make your legs look. love! i have been totally channeling the 70s lately! I wonder what these pants look like on someone that is not a size 0! oh and congrats on your award! I do love your blog layout! ps congrats on the award nom! Love love 70s style! I don't wear pants too often, and if I do it's usually slim/cigarette style, but these are fabulous! 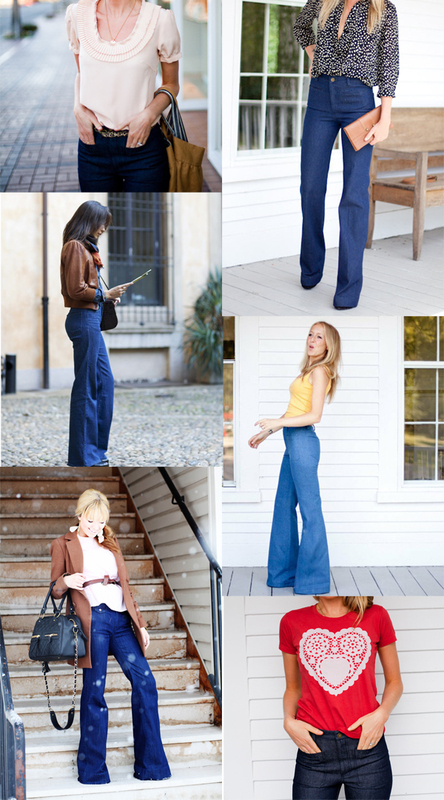 Anna love your site and right now it seems anything goes, flares, skinny, etc! congrats on the nomination! well-deserved, my dear. and i could not be more excited for high rise bell denim!! bring it on! This is soooooo true! I've been looking high and low for a pair here in OK. To no avail! I'm going to have to start the online search I'm afraid. How I HATE buying jeans online! wahhh! I just voted for your shop on the lovelies. You SO deserve it! So sweet of your hubby:) I'm not sure what we'll do yet. We don't make a huge deal out of V-day. Have a fabulous weekend! I voted for you, but I think it used the wrong Google account when I did it. Either way, I hope you win!! Wow I am loving those jeans but won't be going there this time around! No way that they are baby bump friendly! yay! congrats on the nomination anna! AND a big congrats on your award!!! Pssst pretty mama I have a blog award awaiting you too . . .
Heck to the yeah! This is a trend that I'm definitely firmly behind! I love this look -- and it'd be fantastic on you, Anna. This weekend I'm celebrating friends, because they help you get through everything (family too, in truth, though mine is so very far away). Happy Valentine's weekend! now that's something from the 70's i can embrace! especially when it's styled so brilliantly as these uber chic girls have done. pea ess: i am so very, VERY happy you stopped by my blog to say HI! cheers lades. Yes, I'm soooo stoked for this 70s comeback. I think I'm a true free-spirit by heart. Congrats on your nomination! Well deserved, obviously. I'll be sure to check it out. I'm with you...*love* the trend, but *so* not jumping on the bandwagon after the two babies! (c: Congrats on the nomination, that really is something to be proud of! Heading over now to check it out, have a great weekend! I just love this look too! I saved a few pairs of these jeans from a few years ago hoping they'd come back. Can't wait to wear them again. As far as Valentine's Day goes we're supposed to go out for a romantic dinner but I've been laid up in bed since Wednesday with the flu so Monday will most likely be my first day out of the house. After a full day of work I'll probably need a quiet night at home instead. Hope you have a fabulous one! Saw these bluebells over at Emersons - they do look very good on her! The thing is, on me they only look good with high-heels that i seldom wear ... But still, a nice trend! Congrats for being nominated Anna - and happy Valentines! Loving these pants! Don't think I could pull them off but I so love them! You know, I really like them too. Coincidentally, I got a fabulous pair - on sale - this spring. Yay! I'm not a huge fan of 70's fashion but these blouses are really pretty! I wish there were a way to pull off those high waisted jeans with a pregnant belly. I am LOVING that this style has come back into fashion. It's one I have always loved, not necessarily one I can pull off but I still adore it.